Sichuan, China -- Nianbaoyuze, when translated from the Tibetan language, means the grand mountain of boulder. Located on the border of Qinghai and Sichuan provinces, it is composed of about 3,600 mountains and 360 lakes about 4,000 meters above sea level. Though it is said Nianbaoyuze has 360 lakes, the local tourism bureau and local Tibetans said they are mainly 16 large lakes and about 300 smaller lakes dotting the mountains. However, because 360 is a lucky number in Buddhism, the Tibetans believe there are 3,600peaks and 360 lakes in Nianbaoyuze. Nianbaoyuze is said to be the birthplace of the local Tibetan son the Golok Grassland. As the main peak on the southeastern section of Mountain Bayan Har, it is about three hours drive from the beautiful Aba county, located in Sichuan province, and 40 kilometers from the smaller Jiuzhi County. Before the middle of last year, Nianbaoyuze was still largely unknown among most of the outsidersfrom Guoluo Grassland. However, its diversified landforms and various kinds ofplants and wildanimals have attracted not only adventurers but also numerous scientists and geologists. By May 2006, Nianbaoyuze was appraised as a National Nature park,and is now being promoted by the local tourism bureau. Since then, the name Nianbaoyuze has been spread fast among tourists and back packers. Here you can find no lake more transparent or more clear. Being regarded as holy lakes, these waters are forbidden to be touched by people. Only two years ago, two monks from Aba County ventured to swim in the lakes, yet later both were found dead in mysterious circumstances. Nianbaoyuze is also home for various plants and rarely seen wild animals. In the south eastern parts, there are virgin forests of pines and firs. The ravines are home to elusive snow leopards, brown bears and lynxes. Climbing on the main peak of Mountain Nianbaoyuze is the dreams for many mountaineers. 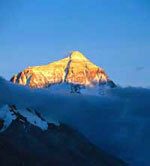 The mountain is covered by a gigantic glacier, and the main peak is 5,369 meters above sea level. The mountain is at a longitude of 101 degrees east and a latitude of 33.35 degrees north. Last year, Nianbaoyuze was named as one of the top 10 mountains with great difficulties for climbing in China. Summer, with hundreds of flowers blooming and the slight changes in weather, is considered to be the best season to enjoy the beauty of Nianbaoyuze. And summer is also a good time to experience the holy rituals initiated by the local monks. Monks from Segeer Temple in Aba County come here every July to hold rituals for those who have finished the three-year ascetic practices, according to the doctrines of Buddhism. The monks will throw green branches wrapped with silk into the lake, which they believe shows respect to the Natural God. So far, no roads have been built to link up to this area, and a single trip across this place will take at least seven days. But a local guide is a must to avoid getting lost in this vast land, and plenty of food and camping equipment is also essential. For common visitors, the Fairy Lake and Siren lakes are most approachable. However, even to walk across the two lakes takes at least one day. Covering an area of more than 10 square kilometers, the Fairy Lake is a freshwater lake teeming with non-squama fish (fishwithoutscales). People cannot even touch the swimming fish in the clean water, because the fish in the lake are also considered holy just like the lake itself. Therefore, Tibetans are forbidden from eating the fish.